Carlos Valverde has DONE IT AGAIN!!! Carlos hired Graudio Forensics to execute an expert assessment over an important recording where attorney Marcelo Soza made some striking remarks around the terrorism case and the participation of current central government officials and some other people. The governmental corruption, distortion and justice manipulation is finally coming to an end. Under the alleged terrorism/separatism case that current central government of Bolivia pushed as the Rozsa case, now Bolivian Justice will have to take into account this striking evidence! Report in Spanish, over the audio of attorney Soza can be found in its entirety by clicking informe_soza or can be downloaded directly from the website of Carlos Valverde. At the request of D. Carlos Valverde (from here on: customer), we proceed to write the present expert report in order to give an opinion on certain specific aspects of several audio recordings. 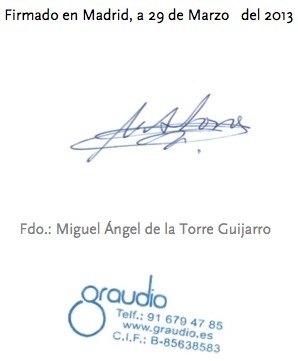 The technical report has been made by Miguel Angel de la Torre Guijarro, Graudio Forensics’ technician, an Spanish company specialized in audio engineering and electronic testing for applications in forensic acoustics, collaborates with consulting firms, law firms and companies in private research, to carry out analysis, reports and expert opinions. Among its ranks, Graudio Forensics has a multidisciplinary staff composed of different professional profiles of forensic acoustics (linguists, phonologists, engineers and audio technical specialists). All procedures and work carried out by Graudio Forensics use as general reference concepts and procedures, the ones established by AES (Audio Engineering Society), organization of which is a member. 1. Determine if the questioned voice appearing in four (so-called voice of lawyer Mr. Marcelo Soza) audio files, corresponds with the indubitable sample (sample GIGA.SOSA.21.12.12 INTERVIEW.THE PAZ.mp3), coming from the staged interview of Mr. Marcelo Soza by the Television of Bolivia. 2. Determine if the recording has been manipulated, edited or otherwise maintains a continuity in time and space. 3. Determine if the analyzed audio samples correspond to fragments of the same recording, or conversely there are similarities or elements of continuity between them. In our work environment, we mean by authentication process, the study aimed at determining if a sound recording maintains integrity during the time interval that happened such recording. This study is also extensive verification of whether the recording is an original record or a copy. From the various analyses which can be made from an audio recording, will be conditioned by the material provided by our customer. In most cases, to perform an exhaustive analysis of authentication, will be necessary to have both the original recording, the set of elements of registration used in the recording process (microphone, recorder, etc.). All files correspond to an audio recording which picks up the conversation between three individuals, male voices, (from now on: speaker 1, speaker 2 and speaker 3) inside a small enclosure (very possibly a vehicle), with low influence of ambient noise and using a semiprofessional recorder (minirecorder type, etc), located very close to the speakers, mainly speaker 1 (so-called voice of Marcelo Soza) and speaker 2 (intentionally distorted voice). The position of speakers with regard to the item pickup (microphone), remains constant in the 4 files scanned. Substantial variations in amplitude and frequency are not appreciated in each speaker. The recordings provide a clear and intelligible sound. – Proximity of the speakers (speaker 1 and speaker 2) to the microphone or recorder device. In the files scanned, no noises are heard, which could be caused by shocks or friction of the microphone. The voice of the speaker 1 (so-called Marcelo Sosa) is clear and intelligible, with the presence of the entire spectrum of voice, does not seem a hidden recording (on clothes or other complement).The noise inside the vehicle by manipulation and movement of objects are frequent. The microphone with respect to each speaker’s position remains constant in all the analyzed samples of fragments, voices have the same acoustic characteristics and its relationship with the acoustic environment and ambient noise is similar. The files keep continuity temporary space so we can say that all the analyzed samples correspond to fragments of the same conversation. The recording is done in an enclosure of small dimensions (possibly a vehicle), with a constant presence of ambient noise (passing of vehicles, pedestrians, daytime activity) and similar features in all analyzed recordings. The following image is a spectrographic analysis of the ambient noise characteristic in 4 samples of audio (signal amplitude, frequency and time). 1. Determine if questioned voice appearing in four contributed audio files (so-called voice of lawyer Mr. Marcelo Soza), corresponds to the indubitable sample (sample GIGA.SOSA.21.12.12 ENTREVISTA.LA PAZ.mp3), from the interview with Mr. Marcelo Soza in the Television of Bolivia. In view of the results obtained in all the analyses carried out, we can say that there is sufficient evidence to consider that L-A (certain voice of Attorney Marcelo Soza) and L-B (voice questioned, attributed to Marcelo Soza), correspond to the same speaker. 2. Determine if the recordings have been manipulated, edited or otherwise to keep a continuity in time and space. 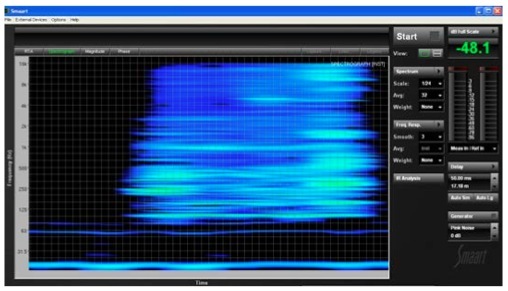 The four audio samples analyzed (AUDIO 1 para identificación vocal.mp3, AUDIO 2 para identificación vocal.mp3, AUDIO 3 para identificación vocal.mp3, AUDIO 4 para identificación vocal.mp3), with an approximate duration of 24 minutes, presented a total of 51 electroacoustic events of short duration, which are not logical in the environment in which they develop. Circumstances that not must be associated to shutdown or malfunction of device recorder, but rather the intentional manipulation after the sound recording process. However the files maintain continuity temporary space and a logical sequence both at the semantic level and as expressive. 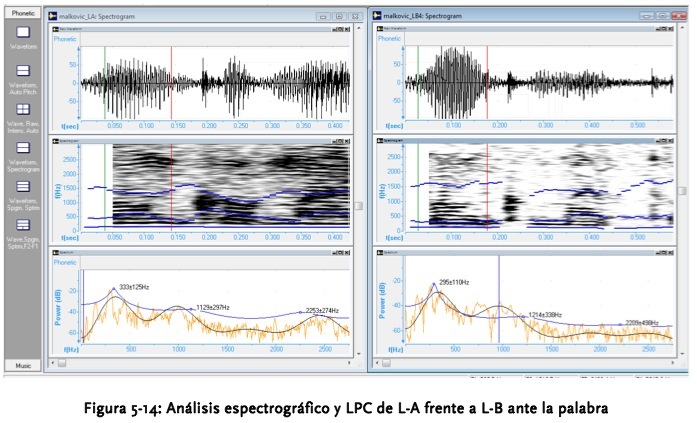 In all analyzed recordings, the voice of the speaker 1 (corresponding to the so-called Marcelo Soza) maintains the same acoustic characteristics, same position and location with respect to the recorder device. 3. Determine if the analyzed audio samples correspond to fragments of a same recording, or conversely there are similarities or elements of continuity between them. All the analyzed audio files share acoustic characteristics and provide information with traits of continuity between them, so we can say that the four samples analyzed correspond to fragments of the same conversation. We can also state that all the analyzed audio samples were recorded with the recorder device. A company member of the Audio Engineering Society (AES), performed the forensic work in a span of 17 days. The Senator Tejada indicates that it must be take into account as proof. A new survey carried out in the laboratory of forensic audio from Spain, Graudio Forensics, confirms that there is sufficient evidence to consider that the voice of the controversial audio attributed to Prosecutor Marcelo Soza corresponds to him. This study, which was performed by Miguel Angel de la Torre Guijarro, audio specialist and director of the Spanish Institute, was commissioned by journalist Carlos Valverde, director of the program “Sin Letra Chica”. The expert work carried out in 17 days (from March 12 to 28) and at a cost of $5,250. “So that the Spanish experts verify that it was the same voice, I sent six audio with the voice of Attorney Soza, taken from the Bolivian television and three links from Youtube,” said Valverde, adding that the report verifies the allegations that he carried out against the Prosecutor for three years and a half. “This report is blunt,” he stressed. Consulted on the matter, the President of the Chamber of Deputies, Betty Tejada, said that the truly qualified expert are evidence so prosecutors can also take them into account and that the competent authority has enough elements and evidence to be able to act accordingly. “Not a single element should be discarded that can clear any doubt of the performances such as the ones by a Prosecutor (Soza), who instead of assuming his responsibility, fled away”, she said. Otto Ritter, lawyer for the retired general Gary Prado, one of the defendants in the terrorism case, said that from the beginning they knew that that was the voice of Marcelo Soza. “In consequence, what now needs to be clarified is the content, what is said in the audio, because it is clear that the voice belongs to Soza” said. Ritter said that with all the reports there are, the terrorism issue has been shown that has been armed by the Government. “What corresponds now is that the Bolivian people know all the truth. To know who put it together and why”. For his part, Valverde expressed concern that Senator (Carmen Eva) Gonzales says that she will go to deliver other tests. “Why doesn’t she show everything she has? If this has no political objective. There, the Senator is wrong. She should show it all as a matter of responsibility with the country”, he said. 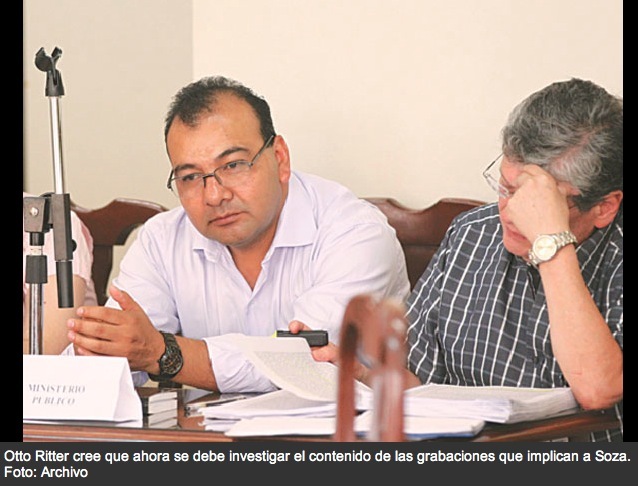 The President of the First Sentence Tribunal of La Paz, Sixto Fernández, who is in charge of the contradictory trial by the terrorism case, said that this Monday, April 1, the report of the re-inventory of the evidence in this case will be known, only because there were abduction of some of these elements reported. The Authority explained that during the week, there was a count of evidence obtained by the prosecution and that they are now in the court instances. This procedure was made known to all parties involved in the case, and once the results are known, the observations will be carried out. Prosecutor Marcelo Soza also announced, through his lawyer, to be present on Monday to declare. The following weeks will be hectic and crucial to disclose all the corruption, manipulation and distortion that Bolivian Justice has been suffering… and we the people have to endure daily until a better government replaces existing one… electoral decisions are coming fast and clearer for 2014!